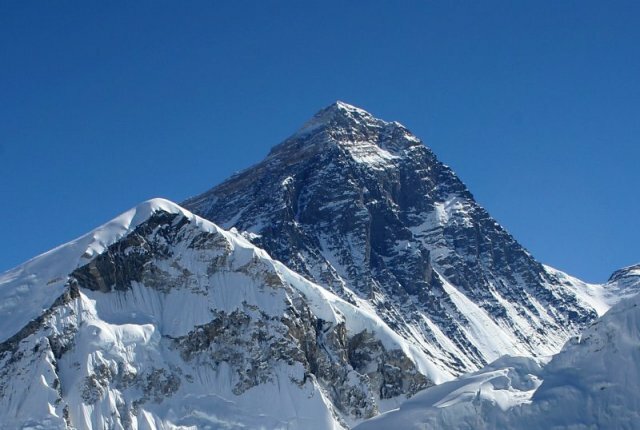 Mount Everest is the highest mountain on Earth, and the highest point on the Earth's crust, as measured by the height above sea level of its summit, 8,848 metres (29,029 ft). The mountain, which is part of the Himalaya range in Asia, is located on the border between Sagarmatha Zone, Nepal, and Tibet, China. So as you may know by now, Everest can’t be climbed in a day. After a 10-14 day trek into Basecamp (17590’), we are welcomed to our home for the next month and a half. From here we begin cycles of acclimatization to varied heights to allow us to prepare for the stress and reality of our summit push. These cycles start with a journey into the famous Khumbu Icefall, one of the most dangerous elements of climbing Everest. Imagine for a moment what it would feel like if you had to cross a bridge between two ten story buildings, and that bridge is made up of three ladders simply tied together. A little scary? Well let’s add to that and say that one of those buildings can literally collapse at any time, or a boulder of ice the size of a tractor-trailer might fall while you’re trying to navigate through this nerve-racking maze. These are just some of the reasons we try to avoid too many of these trips. They average about three hours per way, and we had to endure five round trips this year, including our summit push. It took us four acclimatization climbs to progress to the point of reaching Camp 3, 24,500’ (Camp 1 – 19,900’ Camp 2 – 21,300’) Each climb we would climb higher and stay longer until we were ready for the final climb on oxygen which we would use from Camp 3 until the summit. Then came the patient wait for the window of opportunity. In short, the jet stream which is a 100 mile per hour wind that produces -100 Celsius temperatures sits around the top of Everest. In order for it to lift above the summit and give us the chance to reach the top of the world, we need the warm winds from the incoming monsoon season to lift the jet stream for a short time, sometimes only a day or two. The other problem is the competition … there are about 300 climbers from around the world from various other expeditions looking for the same window of opportunity, and if we all try at the same time, it bottle-necks which slow all the climbers down. This not only risks a successful pace for summit, it also puts everyone’s lives in danger. To try and avoid these problems, the expedition leaders do their best to communicate and organize their teams, but this doesn’t always play out the way they hope, and when things go wrong, they really go wrong! When we believe the window is coming we first climb to Camp 2 (day 1) and then following day rest (day 2) for the harder days ahead. From there we progress up the difficult Lhotse wall (extremely steep and icy) to Camp 3 (day 3) where we sleep on oxygen and continue the next day (day 4) to the South Col, also known as Camp 4, the beginning of the Dead Zone 8000m (26000’). It is called the Dead Zone because at this altitude your body literally starts to shut down and cannot sustain itself for very long. The other problem at this altitude is that if someone gets into serious trouble, rescues are nearly impossible. At Camp 4 we rest until about 9pm and then in the dark we begin the true summit push. At this point, you had better be sure why you’re here and that you have what it takes, because there is no turning back. Remember those bottle-necks I mentioned? Well, we hit one hard! It turned out that a Turkish climber was trying to climb without oxygen and his extremely slow progress caused a huge build-up of climbers. A steep headwall that normally should take only 90 minutes took us more than three and a half hours. In the end, this began the process of suffering a mild case of frostbite in my toes, because there was a number of other situations through the morning just like that one. It took twelve hours to reach the summit, with one of the scariest moments being the Hillary Step. Straight up a rock face with crampons at 28000’ (like climbing with ice skates on rock) Nepal on one side and Tibet on the other, no room for error! And finally you see it--the top of the world … and what goes through your head? First off, I told myself, “Don’t get too confident, you’re not there yet, and did you save enough energy to get down?” Then I started to review everything that it took to get here, all the hard work and sacrifices and then finally I started to think about all the people in my life and those people that believed in me and I didn’t want to let them down. As I reached the summit there was cheering from all around, but to my surprise tears came to my eyes and all I could think about was my father and grandparents that had passed and I was overcome by a feeling of love for them and felt as though they were right there with me, celebrating this moment. Tough to see through the tears I had to take a moment and clear my eyes and focus on the majestic view from the top of the world … at that moment I had the honor of joining an elite group of people that were experiencing being the highest humans beings on the planet, nothing can ever duplicate that feeling! I have worked very hard to reach a number of goals in my life, but none have required such a depth of commitment as climbing the world’s highest mountain. This feat could only have been achieved with the love and support of my family and friends, and I hope all of you can share in this success because you deserve every last step of it! The is an expression in the climbing world “ You can dance with the mountain, but you have to let her lead!” I am thankful for the dance, and all of your prayers …. God Bless and please remember to tell those people in your life that you love them! Months of preparation and then weeks of climbing up and down the uppler slopes of Mount Everest to acclimatize to the killing altitude, and a the final surge--the toughest 12 hours of Shawn's life to date--were met with success when he reached the highest point on earth. "I did it one step at a time, literally,." he said in a satellite call from Camp 4, just 100 meters below the Death Zone. The descent was delayed due to Shawn's team performing rescues for other climbers in trouble and a snowstorm that blew in. Describing the highly technical climb that is the Hillary Steps (which are over 28,000 feet above sea level) Shawn likened it to, "Putting on iceskates and then trying to go straigh up a vertical cliff." 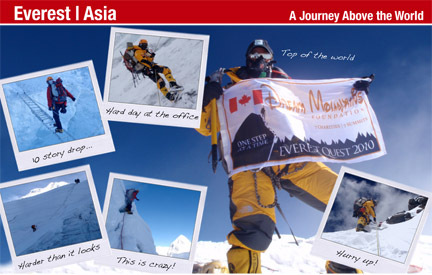 Once he reaches Base Camp and has access to email, Shawn will update his blog. How do you describe living at 17,500'? I guess first of all, who would consider even calling it home? The 9000 trekkers that live their dream of visiting Everest Basecamp each year only touch and go. For the most part, sleeping there and calling it home is only for climbers. The Nepal government issued about 30 permits this year to climb Everest, and each permit includes 7-10 climbers (the cost per climber is about $10,000 for the permit, and the overall cost to climb Everest is around $75,000 when all costs are considered). There are also the climbers for Lhotse, the other 8000m mountain next to Everest and then the support teams of cooks, porters and Sherpas, which equals close to 600 people all in all. Our basic thoughts are eating, sleeping and training for our next acclimatization cycle. Accommodations are a two man tent that we have to ourselves ( as we climb to higher camps on the mountain, we share a tent which has already been established at the camp, and my tent mate is Andrea from Guatemala). It is amazing how much you can look forward to your little 4x4 space, which you call home, when you come down from higher camps, especially my down-filled air mattress and pillow, ha-ha! As a point of interest we all have two sleeping bags, one -20c for Basecamp and a -40c which we keep at Camp 2, and bring along for the higher camps. Unless we're climbing, we tend to have breakfast around 8:30am, lunch 12:30, and dinner at 6:30pm. Lights out around 8:30-9pm, or at least to our tents to read, maybe watch a movie, or listen to some music to fall asleep. Lots of food, but we're never really sure what is coming out of the kitchen. Breakfast can be eggs of some variety, rice pudding or porridge, toast and sometimes potatoes. Lunches and dinners are mixes of pasta dishes, Nepalese food, salads, veggies and stews, always starting with hot soup and finishing with canned fruit for dessert. I know what you really want to know.... showers? We do have a shower tent which is actually pretty cool, considering the circumstances. It is propane driven, so they pour the water into a small holding tank and then the propane heats up the water and it is released through a normal shower head. Good for about 7 minutes. On an average, with our climbing schedule, we shower about every 10 days - thank God for Merino wool underwear! There is a fairly social aspect at Basecamp and it is common to visit friends or make new ones from other expeditions. My friend Megan is here climbing Lhotse, and we get together for tea often as well as my other friends from home, Ellia, Dr. Al and Gary. Other than that, I have met numerous of other climbers from around the world and have started new friendships. It is common to gasp for breath for no reason up here, especially when you’re sleeping – it’s part of being at 17,500'. If you have never been in high altitude, it is tough to explain to you how high it really is, and how your body reacts. For an example, any cuts will not heal due to lack of oxygen, and your body is prime for illness because your immune system is low. Overall life at 17,500' is as comfortable as possible but we're not meant to sustain it for any length of time and I can assure you 2 months is long enough! I will appreciate this summer more than most, especially my Harley and home on the river in Brockville. Shawn’s Everest Blog, May 8th -- How's Your Health? Now that's the million dollar question! April 1st (Fools’ Day) comes around and it's time to fly to Lukla to start our trek, but the night before I decide to enjoy some of the 5 star Yak & Yeti's "Butter Chicken". BIG MISTAKE! The first 2 days of the trek I am accompanied by bacterial diarrhea--not fun! The bigger problem is that as you ascend your body is constantly stressing and adjusting, so being sick just multiplies. Next I get a cold sore ... reasonably simple at sea level, but this one gets out of control, and lets just say I was not attracting too many ladies... Again the bigger problem is that my immune system is constantly being challenged and 10 days later we arrive at Basecamp and guess is a perfect candidate for the famous "Kumbu Cough"? Now this is not your ordinary run of the mill cough. As the weeks progress my cough gets so bad that my abdominals ache, I think I am going to break a rib and I cough so hard that I regularly vomit. So now I can't hold food down and I am losing weight quicker than the average, 15-20lbs. Time to see the doctor! This year at Basecamp they are doing major research on the Kumbu cough due to its severity and they are running a blind study that offers candidates either a test drug or placebo, but neither the doctor or you will know till the test results are sent back to the states. I believe I was blessed with getting the test drug, and about a day before our 3rd acclimatization cycle I started to feel sufficiently stronger and the cough was going away! I can't tell you how much physically and emotionally better I felt for that climb. At 24,000' I was starting to feel like the climber I was and more importantly understand that I had been sicker than I had thought, and I now understood why my body hadn't been behaving as I had hoped since the beginning of the trip. My increase in strength and stamina was so apparent that the whole team noticed. As I type this entry, we're all down in Debouche recovering--about 3,500' lower than Basecamp and there are trees and flowers instead of the barren boulder and icescape of Basecamp. My appetite is enormous and we're eating, sleeping, and relaxing both physically and emotionally. This is a necessary step for our final summit push, which is coming up soon. Again thanks for all your prayers, I feel blessed that I am back to full strength and ready for this epic challenge. No mistake, this will be hard, but I am ready and motivated! So as I am going through the airport security in Ottawa, the agent asks me if this is mine as she hands me a copper penny. Considering I am about to embark on the journey of a lifetime and attempt to climb the highest mountain in the world, I will certainly accept the "lucky penny" and put it in my passport folio for good luck. A week later I am checking my satellite phone from the hotel and I am out on my balcony talking with my buddy Sonny and all of a sudden I can sense the urgency and it happens ... a pigeon shits on me! OK, so maybe you find that funny, I know for sure Sonny did ...good news that Sat phone was working. I was telling the story to my friends Don and Karen, and Karen informs me that it is extremely good luck when this happens ... the question is, should I wash the shirt? So I am in Namche and watching this crow, and I swear we're connecting in a strange way ... once we get to Basecamp I notice there are a lot of crows around during our "Puja - to be explained", and I later learn that the Sherpa people believe that the crows are the reincarnated souls of the Sherpas who have died on Everest and that they are good luck! Nepal is a very spiritual place; unique in that there are a number of beliefs that co-exist and interact here. The world should really take note of this! There is a lot of respect given to the mountains by the Sherpa people and they ask of us as climbers to respect their customs. In Pangbouche on our trek up, we received our first "Puja", a blessing from the Lama Geshe to ask for our safety. Make no mistake, the Puja is not to guarantee a successful summit, but instead to protect our lives. The Kumbu Icefall is a moving glacier and from one hour to the next can change dramatically. It can take 3-9 hours to travel through and is unfortunately the necessary first step to climbing Everest. It claims a high portion of the numerous deaths on this mountain every year. Therefore before every stepping foot in the Icefall, a climbing team must receive a second Puja. It is considered bad luck to do otherwise and no Sherpa would follow you from that point if you disregarded this tradition. So all said and done, whether you believe in luck, fate, spiritual belief, or the mountain goddess, I believe that the success of summiting Everest will be what it will be, but coming home safe to my friends and family in one piece, healthy and happy is worth every prayer! Please know that I am thankful and grateful for all your prayers from back home. Shawn’s Everest Blog, May 2nd: "The World's Highest Poker Tournament"
As you all know by now, one of our team is an executive of ESPN South America and has been sponsored partially by PokerStars.net. The irony is that Leo doesn't know how to play poker and neither does anyone else on our team, so guess who was nominated to teach them? All participants must have climbed a minimum of 6500m or 22000' in order to qualify ... The winner of the tourney will be invited to a tournament in the hot, sunny Caribbean, and the fine folks at Poker Stars will be making a donation to a Nepalese charity. The actual date of this unique tournament is based on the climber's acclimatization schedule and the weather predictions for summit push, but I'll keep you all posted on the results. One question ... anyone interested in joining me in the sunny south? Hope you all enjoyed this fun fact from Basecamp, there are a lot of serious and life threatening stuff going on up here, and this is certainly something that brought some relief to all of us. So who would you want to share an adventure of a lifetime with? Willie, Damien, Leo, Alvar, Ramone, Cunny, Charlie, Topo and Andrea are my constant companions for our two month exploration of the world's highest mountain. Willie & Damien are both world famous climbers and our guides (Willie has summited Everest nine times) Leo is an executive with ESPN South America and as a result there is a 5 min special every Friday on ESPN SA about our expedition (I'll try to get a tape of it in the future, so practice your Spanish). Then there are the boys from Bariloche! Five mountain guides from Argentina that are on a sponsored expedition, planning to make their country proud. And, of course, the one token, tough, and handsome Canadian to round out the group, and there you have it ... The 2010 Everest Dream Team! Amongst the trekkers of the world, the trek to Everest Base Camp is considered the Superbowl, the ultimate adventure of endurance and acclimatizing combined with the some of the world’s most incredible views. Started with a crazy flight from Katmandu to Lukla … an organized chaos in a small regional airport with every trekking/climbing expedition fighting for the early flights. Certainly experience is an asset in this situation and our fearless leader had us on a Twin Otter and off to the gateway of the Khumbu in record time. After lunch we continue and cross the confluence of the Dudh Kosi and the Bhote Kosi on a high suspension bridge and climb steeply for about two hours to reach Namche. This is a prosperous trading town and the capital of the Khumbu Region. It is here that we spend 2 nights to allow our bodies to become acclimatised to the altitude of 3,450m (11,300ft). It is amazing how commercialized and developed this little town is by the region’s standards. Plus considering the altitude, everything has to be brought up here by foot or Yak. This was also our first hot shower in the last few days. Gas operated, and not really that hot, it was still a small blessing! The only thing here is that once the sun goes down, everyone filters into the common room where there is the only heater in the whole building and believe me it is chilly otherwise. From Namche we move along the well-worn Everest trail that contours around the side of the valley high above the Dudh Kosi. As we follow the path, we get our first really good views of the great peaks of the Khumbu: Everest, Lhotse, Nuptse and Ama Dablam. Passing by several villages and numerous tea shops, we cross the Dudh Kosi river and make a steep climb to Thyangboche, home of an impressive and recently rebuilt monastery as well as an amazing little bakery that we enjoy some great pastries. After our little snack and a look around Thyangboche we continue down to the river and the village of Deboche (3,700m/12,135ft) to our little lodge for the evening. Met some really cool young Welsh students in the common room and played some cards until lights out … Later on in the trip I will run into them again at the summit of Kala Patthar near Gorak Shep … Reminds me of my good friends Dom and Michelle from Wales that I climbed with in Bolivia … Wales seems like a very friendly place, something like Canada! Off to Periche for a few more nights and a seminar on high altitude sickness from the last clinic before Basecamp … amazing common room in our lodge, bright, warm and spacious! As our day begins we eventually reach Dugla situated below the snout of the Khumbu Glacier, which turns out to be a convenient place for lunch. After lunch, the trail starts steeply to climb up beside the glacier moraine. Another couple of hours the track eventually leads to a small cluster of tea houses pleasantly situated at Lobuje, and about three hours beyond Lobuje we reach Gorak Shep (5,220m/17,126ft), the site of the 1953 expedition's base camp. Finally our last day and the prize in sight ….Contouring along the valley side, the trail leads on to the moraine of the Khumbu Glacier and becomes quite vague, weaving between mounds of rubble. After about 3 hours we eventually reach Base camp near the foot of the Khumbu Icefall. This will be our home for the next six weeks. So here is where we say goodbye to the trekkers and the completion of they’re life long dream, and the beginning of ours! My good friend Megan McGrath (the first Canadian woman to climb the highest mountain on each continent) once gave me the advice that, “To have the strength to climb any mountain, you need to know why you’re there.” Sort of good advice in any life challenge wouldn’t you think? So here I am becoming a world class mountaineer, climbing mountains in Africa, Alaska, Bolivia, Argentina, Antarctica, and now Everest in Asia. The problem is that what drives me comes from somewhere deep inside, and not necessary for the pure love of the mountains like most people in my shoes, or should I say boots. However, with that said, I believe that the mountains are an excellent metaphor for life challenges and this could be my attraction to them. In life we all need a path, a direction, or maybe just a purpose. I am fond of the philosophy … conceive, believe and achieve! I have always felt that if someone wanted to change their lives or alter their direction, it is within their power, but decisions, sacrifices and hard work are required if they really want to achieve the desired outcome. Those of you that have known me for years have seen my commitment to the people and projects in my life, and my commitment to bringing awareness to the DREAM MOUTAINS FOUNDATION and all the good we can do as a collective is certainly part of the equation, but it maybe deeper than that. I lost my father in my twenties, at an age when most guys are really just becoming men. All sons, regardless of age, are most likely trying to live up to their fathers expectations, but since I didn’t have the opportunity to get that feedback, maybe I push beyond what is considered normal, searching for some kind of closure that ultimately only I can find within myself? I have a wonderful family and network of friends that care about me and there is certainly a part of me that doesn’t want to let them down, even though I know that they only want the best for me and would never want me to put myself in harm’s way. I guess to answer the question, “What do you think before you head off to climb the highest mountain in the world?” I have to say, I am grateful for the life I have and the people I share it with, and those feelings of gratitude and love will accompany me every step of the journey to the top of the world. Success on Everest will be what it will be, and only time will tell the outcome. Until I can write you all again I hope you all are enjoying your WARM and COZY spring!